Suspicious Packages Present No 'Biological' Threat, Feds Say Officials say they're taking seriously the potential explosive devices that were addressed to Trump critics — including Joe Biden and actor Robert De Niro on Thursday. 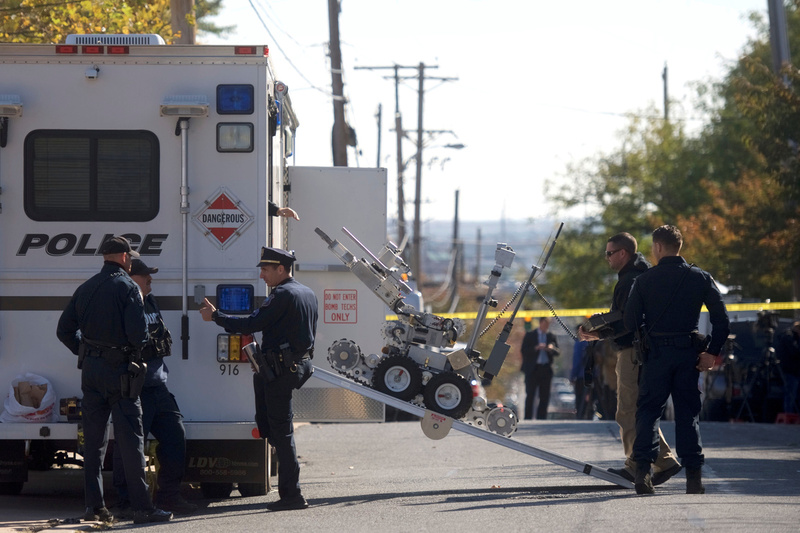 Law enforcement personnel operate a bomb disposal robot outside a post office which had been evacuated in Wilmington, Del., on Thursday. Federal authorities expanded their nationwide search on Thursday for the person who sent a wave of suspected explosive devices to political nemeses of President Trump. Ten devices addressed to eight targets have been intercepted or discovered, but no one has been hurt. It isn't clear whether or not the attack is over; the FBI said it can't rule out that more suspicious packages might still be moving through the mail. Investigators have concluded that white powder found with a suspicious device this week is "not biological" — but they said that the devices are "something that should be taken seriously." New York City Police Commissioner James O'Neill told reporters in a news conference on Thursday that he wasn't prepared to identify the powder in the envelope because inspectors are still testing it, but they are satisfied, as he said, that it is not a bioweapon such as anthrax. O'Neill also said that authorities are treating the apparently homemade suspicious devices addressed to political targets this week as "suspected explosive devices." Although they might be amateurish, "we are treating them as live devices," he said. "As far as hoax devices, we're not treating it that way." O'Neill and other officials were responding to questions about photos that have been circulated of the suspicious devices that led some experts to wonder whether the items pose a real threat or whether they were intended to be a scare. The suspicious devices are either at the FBI Laboratory in Quantico, Va., or on their way there now, authorities say, where the FBI's specialists will reach conclusions as they continue their examinations. The FBI said two suspicious packages were discovered in Delaware on Thursday morning addressed to former Vice President Joe Biden, while a third was found in New York City addressed to actor Robert De Niro. O'Neill said a retired New York City police detective who had seen pictures of a device that arrived at CNN recognized one that looked like it at De Niro's address in Tribeca, in Manhattan. He called the bomb squad. All of the new envelopes evidently were "similar in appearance" to seven packages already discovered this week that had been sent to six other high-profile critics of President Trump, including former President Barack Obama and former Secretary of State Hillary Clinton. 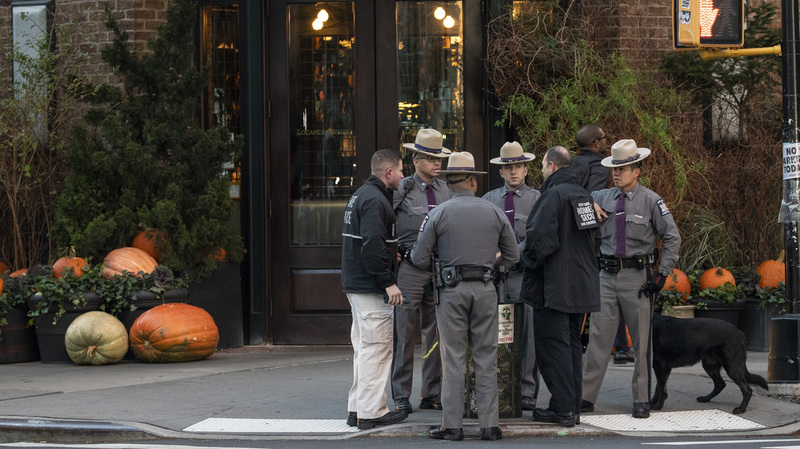 Law enforcement officials gather near Robert De Niro's Tribeca Grill restaurant in New York City after another suspicious package was found early Thursday. De Niro gave an expletive-laced speech at this year's Tony Awards, ripping into the president. Trump shot back at him on Twitter. Other suspicious packages were addressed to former CIA Director John Brennan in care of CNN in New York; one to former Attorney General Eric Holder and two to Rep. Maxine Waters, D-Calif. The first package was reported on Monday at a residence of billionaire investor George Soros, who is an active supporter of Democratic and progressive causes. Soros' Open Society Foundations has been a financial supporter of NPR. The package addressed to Holder did not reach him at his law firm in Washington, D.C.; instead it was rerouted to the return address affixed on the envelope — that of Florida Rep. Debbie Wasserman Schultz, another prominent Democrat. Wasserman Schultz's office was evacuated when the envelope arrived on Wednesday. She said she was "deeply disturbed by the way my name was used." New York Gov. Cuomo said the two suspicious devices found in New York City shouldn't stop people from going about their business as normal. "Don't let the terrorists win," he said. "There's no reason to be afraid." Attorney General Jeff Sessions said Thursday that "across the administration, we condemn the actions that led to these activities in the strongest possible terms and are determined to make sure that we get to the bottom of it and justice is done." Investigators are now working outside Washington, D.C., in New York, in Florida and in Los Angeles — where one of Waters' packages was found — to determine who sent the envelopes and why. An explosive ordnance disposal team destroyed the package sent to Soros through a controlled detonation. Officials say investigators are analyzing the materials from that device to try to help in understanding it. Anthony May, a former bomb technician for the federal Bureau of Alcohol, Tobacco, Firearms and Explosives, told NPR that judging by the X-ray photos of the device that was found at CNN, he has concerns about "some possible hazardous material" inside the pipe — but "there are also some items that should be there that aren't there." Specifically, he said, the X-ray shows only one set of batteries for the timer. That isn't enough, he explained. "There would need to be a second set of batteries or another power source within that device to function the switch causing the device to explode," May said. "I'm not seeing that second power source." A report in NBC News suggested that the devices included a parody of the Islamic State's black flag. Law enforcement officials say they're increasing security for people or organizations that might be targeted. John Miller, the New York City Police Department's deputy commissioner for intelligence and counterterrorism, used the example of the response to the bomb that targeted Soros on Monday. Police officers visited other "locations associated with the Soros family, his businesses," and then when the devices addressed to Clinton and Obama were discovered, "we really widened our outreach," Miller said. Trump has been briefed about the investigation. He said on Wednesday that the inquiry into the packages will have whatever resources are needed, and FBI Director Christopher Wray has pledged that the bureau will not rest until the culprits are caught. "This investigation is of the highest priority for the FBI," Wray said. "We have committed the full strength of the FBI's resources and, together with our partners on our Joint Terrorism Task Forces, we will continue to work to identify and arrest whoever is responsible for sending these packages." NPR correspondents Hansi Lo Wang and Miles Parks contributed to this report.